Hi, how is monsoon treating you ? For me monsoon brings in hearty warm soups, finger chips and a warm cup of black coffee. This time Anshika is fed a lot many variety of soups since she has cold and cough. She started rejecting almost everything fed and is in the mood for only soupy-liquid consistency. No worries . Let her eat what she wants to have; I decided. So thought of making wholesome nutritious soups for her which she will have without any fuss. Yes this one is beetroot carrot soup for babies. Carrots are rich in beta carotene , Vitamin A and other minerals. It is an excellent laxative too. Beetroot on the other hand is a good source of iron, folate and manganese. Ghee or butter - 1 tsp. What’s the monsoon special for your baby ? 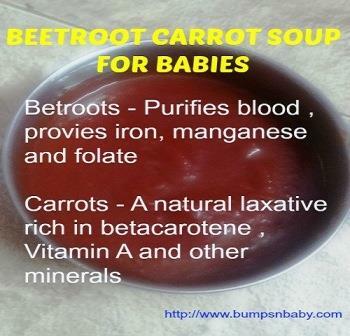 Do try out this simple beetroot carrot soup for babies and let me know how your little one responds. Previous ArticleWhy I Hate Kajal in Baby Eyes? Hi sangeetha my son turned 6 mnths old.what food can I introduce to him. Is it ok to give ghee to a 6 month old baby? Yes Sugandha, completely fine. You can give 1/2 teaspoon of ghee a day. Thank you for your reply. Can I try some new foods or should continue with what am giving now? Continue with what you are giving. Introduce new foods within an interval of 3-4 days to check for allergies or rashes. My LO just turned 6 months old, he is not eating Apple puree. What should I do in order to make him eat? Refrain from giving apples for a week and then restart.See if he is liking it again. Good recipie and I love your blog.can u tell me how to make beetroot puree n how its differ from beetroot soup. 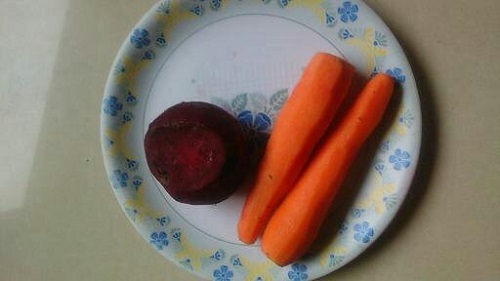 Also should I introduce beetroot alone as a single veggiee or can be given along with carrot. My LO is alreday eating carrot puree.she is 7 months old. Hi Kalyani thanks for commenting and welcome to Bumps n Baby. I will tell you the difference between a soup and a puree. Any vegetable or fish or meat cooked in water having a liquid consistency is a soup. 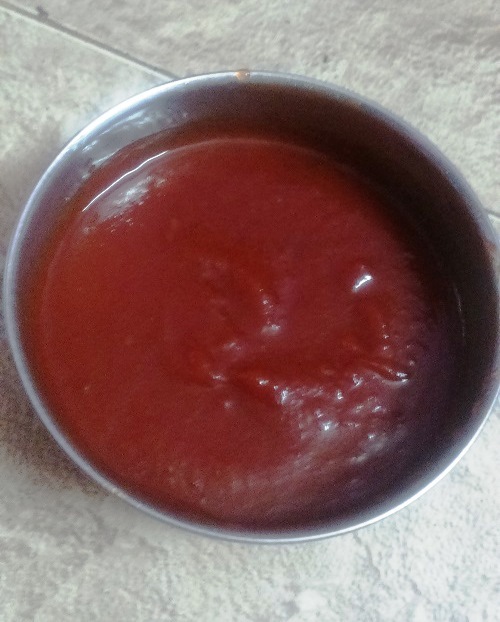 Puree can be the blended form of a vegetable or fruit; not necessarily boiled. But in the case of beetroots we can’t differentiate as they are seldom given raw to babies as such. 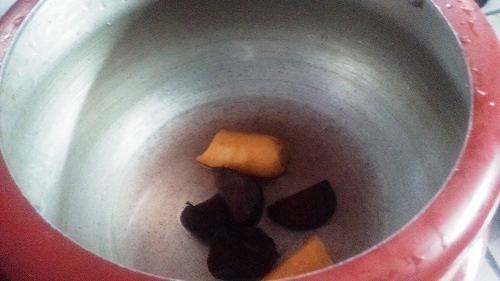 You can give beetroot as a single veggie soup or can be combined with other veggies too. Its purely your choice.